Starting in January, after the Agee thread has completed, I will be providing more daily film criticism. Gregory Peck mocks the poor? 13th Letter - I've never seen that one, and quite frankly Linda Darnell's films have never done much for me. The Yearling - Like Old Yeller this one is well acted with superb production values and personally makes me so depressed I want to throw myself from a high building. And those parents, those awful parents! A father that refers to the son as "boy" and a cold as ice mother! The boy turns to a deer for friendship and affection and then the parents want him to shoot it??? Yikes! In Person - I've never seen that one, but I'm looking forward to it if itever shows up on TCM again. Shield For Murder - O'Brien is a cop and he plans a caper that makes Frank Drebin of the Naked Gun movies look like an ace detective. And all so he can buy a tract home and live the post war American middle class dream with his barmaid girlfriend. It's got atmosphere but it's got tons of plot holes too. Private Lives of Elizabeth and Essex - Actually, this is one of the few costume dramas I enjoy. There is such chemistry among the main players and that slap Davis gives Flynn makes him look like he's thinking of slapping back...for just a second. File On Thelma Jordan - Great noir with femme fatale Barbara Stanwyck making married D.A. Wendell Corey fall for her to the point that he throws the murder case against her because she convinces him she's innocent. Since You Went Away - I can see why it was popular when it came out - a story of gals making a go of it alone on the homefront - but today it just seems overly long considering the story it is telling. It's interesting that the soldier doesn't want to marry his young girlfriend not because he think's he'll die in battle, but because he is afraid of being disabled and living and then having a young wife saddled with him. One of the first films to breach that subject. THE YEARLING is certainly a tearjerker. I will not be going over the slap in ELIZABETH AND ESSEX as that has been covered elsewhere. Selznick had good intentions with SINCE YOU WENT AWAY. Down the road I will be discussing I'LL BE SEEING YOU, another Selznick production with some of the same cast. It may have been the first film to focus on post-traumatic stress disorder. THELMA JORDON is a logical follow-up to DOUBLE INDEMNITY, and I am surprised it did not get selected for Stanwyck's SOTM tribute. THE 13TH LETTER is a very moody, atmospheric remake shot on location in Quebec, though one gets the feeling a lot was lost in translation from the original French picture. Reviews of the earlier film say it offers a biting social commentary, but this film seems to shy away from that. Instead, Zanuck and Preminger have focused on the more entertaining elements of a man's life unraveling because of adultery, and it has hardly anything to do with society at large, unless the suggestion is that all society's upstanding citizens are perverse in some illogical way. The casting of THE 13TH LETTER is somewhat intriguing if not problematic. Charles Boyer is perfectly suited to the role of Dr. Laurent, but as much as one enjoys Michael Rennie, he's a little too British to be believed as an immigrant who has lived in Quebec for any length of time in this picture. Undoubtedly, there are British immigrants in Canada; but an American actor like Gregory Peck could just as easily have filled the role, since there are Americans in Canada, too. Even more out of place is Irish-born Constance Smith chosen as Boyer's wife. Was it that Zanuck wanted to cast the picture with the very best actors under contract, and most of those performers happen to hail from Britain? Why not cast the roles more authentically with Canadian actors, or at least hire gorgeous Micheline Presle as Cora Laurent, or perhaps Danielle Darrieux, and with such casting allow Boyer to speak more French with his onscreen wife. The one role, after Boyer's, that is cast well belongs to Francoise Rosay as Mrs. Gauthier. In the hands of a lesser talent, the part of the vengeful townswoman would have been wasted. Rosay's character, more than any other, drives the narrative forward. For it is her quest, along with ours, that determines to get to the bottom of the poisonous letter writing campaign that has exposed passions and stirred up a hornet's nest of trouble in the local village. 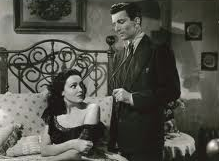 Finally, there is Linda Darnell as Denise Turner, a bedridden woman who may or may not be a true invalid. Darnell is once more playing a devious-minded female, this time trying to get her hooks into the doctor played by Rennie. Though the film is technically a noir, Darnell is not exactly playing a femme fatale, because on some level the character's disabilities will engender some sympathy from the viewer. Darnell and Rennie certainly generate sparks, but Preminger does not always photograph Darnell like he should. In this film, she sinks into a rather large bed and only when the director chooses to give her the obligatory close-up do we see some life radiating from under the covers. Because of Darnell's apparent unimportance to Preminger's cinematic world, she becomes a specialized but muted ensemble player. One would never know that she has received top billing from the studio for this picture coming in on the proceedings after the opening credits. TopBilled; Did you write this? >TopBilled; Did you write this? Well, great job! I have seen this US version as well as the French one and like them both. Use of the word 'technically' related to how film noir is defined can open up a whole can of worms, as it what are the technical requirements of noir. As you know that type of discussion can go on forever! (but I do agree with your comments). Thank you. 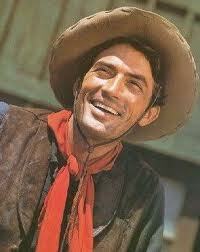 Wait till you see what I have written about Gregory Peck in tomorrow's review of THE YEARLING. Did you like the French version of THE 13TH LETTER, called LE CORBEAU? Yes, I have seen the French version called LE CORBEAU. (that is what I meant when I said I saw both versions). Both are good, interesting movies. Look forward to future reviews. Will you be doing this AFTER TCM shows the movies or BEFORE? If before it would be nice if you put down the date time TCM would show the film (yea, sorry for being so demanding.). Well, some of these are reviews of films I have watched either from my own collection, or on Netflix or the other cable channels. If they are set to air on TCM around the current time, given what is known to us with the latest schedules, I will gladly add a little note mentioning that. Undoubtedly, there are British Immigrants in Canada; but an American actor could just as easily have filled the role since there are Americans in Canada too. TopBilled; Canada has a population of about 35 million people, half of whom are either British immigrants or certainly descendants of British immigrants. However, at last count, there are only about 250 Thousand Americans living in Canada and certainly back in 1951 , probably a lot less. The chances of an American actor living in Canada are next to nil, or an American actor appealing to the Americans living in Canada back in 1951 as you state, does not make sense. I LOVE "Le Corbeau!" (1943). A French-Hitchcockean kinda film. > > TopBilled; Did you write this? TopBilled! You've been holding out on us! With stuff like this in your noggin don't bother with Agee's observations just give us your own! I do a little reviewing and your stuff puts my stuff to shame. It's not easy to do either without slipping into a "and then..." kind of storytelling narrative. Have you ever looked at imdb reviews? There's a guy over there called "planktonrules" that has reviewed over 13500 films and shorts. I don't know how he does it, but it is definitely his original work because you can see the common thread of his thought process in them all. Not like Harriet Klausner, famous Amazon reviewer, who pretty much copies the backs of book jackets and posts them as reviews. Sorry to blather on and on, but the long and short of it is this - good work, keep them coming. lol....I find it funny, if not odd, with the phrase above. If I remember correctly, the script establishes that Rennie is a fairly recent arrival to the town in Quebec. He even explains to Darnell's character what happened to his marriage, when he was a Dr, in London. The fall of that marriage led to his leaving Britain. Despite four films together, Linda Darnell and Otto Preminger did not like each other, or liked working together. Linda was very upset when she was cast in another Preminger movie, but acquiesced because she liked the idea of playing a cripple. Don't know if her part was originally more prominent, and Preminger, or Zanuck, subsequently cut out some of her scenes. Airs on TCM Friday January 4, 2013 at 4:00 p.m. EST. THE YEARLING is based on Marjorie Kinnan Rawling's 1938 Pulitzer Prize-winning novel about a boy (Claude Jarman Jr.) and a pet deer in the Florida backwoods in the late 1800s. On-location filming adds realism to the MGM production, though a replica set of the family farm has been built on a studio lot in Culver City, California and much of the action is shot there. While Technicolor gives the film a rosy glow, it does not necessarily add to the drama. In fact, the picture would've been just as effective in black and white, perhaps more so to illustrate the somewhat bleak conditions that the family endures. Gregory Peck and Jane Wyman are cast as the parents and Wyman, in particular, turns in a fairly credible performance as Ma Orry Baxter. However, Peck seems to play his poverty-stricken character of Penny Baxter almost for laughs. Should the boy's father be a lampoon of modest, humble folk; or show what sort of silliness may exist among those who live down-on-the-farm? After all, this is not material by Erskine Caldwell, and one wishes that someone might have reminded the director, and he should have told Mr. Peck. Spencer Tracy was MGM's original choice to play Pa Baxter. It seems very probable that if the original casting had remained intact, the Baxter patriarch would have been conveyed with more subtlety. Imagine how authentic scenes would have been that featured Mr. Tracy in a movie where the lead actor actually believed in the hunger, loneliness and fear of Rawling's story, instead of finding it something to smile about, to laugh about, and ultimately, to shrug off. Tracy did some filming in Florida when the original production started in 1941. After a couple of months, production was halted and the film shelved. It got a couple more starts and stops, in what was probably the most trouble plagued movie shoot of the 40s; it makes the FOREVER AMBER debacle look like a trouble free filming. The story of the filming of THE YEARLING would make a compelling book. > The story of the filming of THE YEARLING would make a compelling book. Completely agree. The finished product went over very well with audiences and most critics. So MGM's efforts eventually paid off. Incidentally, some of the location footage that had been shot at the beginning was used in the final film. Ginger Rogers stars in this screwball comedy from RKO about a Hollywood actress, who after a recent nervous breakdown, tries to get away from it all at a wilderness retreat. But her nerves are once again on end when she attempts to recover with the help of suave and charming George Brent, on loan from Warners. At one point, having become rather annoyed with his less-than-successful attempts to romance her, she throws her hands up and looks at him contemptuously. Out of frustration, he asks what she wants him to do, and she tells him to go climb a tree. He then asks what tree in particular, and she says THAT tree, pointing to one off-camera. In the very next shot, he is actually up in a tree when she calls him in for dinner. Some of the comedy works very well, and there are genuinely funny moments. However, it is always a bit surreal to watch an actress play an actress and perhaps it does require more than the usual suspension of disbelief to accept that her neurosis would be so easily solved by forging a relationship with a rugged outdoorsman. It probably helps that the role was cast with George Brent, instead of Fred Astaire, the studio's original choice. Indeed, having Astaire play a backwoods brute with curative powers may have been even more a stretch. Regarding Mr. Brent, specifically, he is just like he appears in countless other movies. In this one, he projects both awkwardness and sexiness. His performance seems to rely on a limited but likable bag of tricks that he has used to great effect in previous pictures. As for Ms. Rogers, there's a timeless quality about the way she projects both insanity and peace. Previously, Edmond O'Brien has made a name for himself in crime dramas like D.O.A. and 711 OCEAN DRIVE. In those pictures, he plays a man of justice, sometimes put in compromising positions and dealing with ironic situations. This time, he is decidedly on the wrong side of the law. Mostly, the plot of SHIELD FOR MURDER can be described as a good-cop-turns-bad-cop story, with O'Brien playing a crooked detective whose increasing corruption becomes more and more obvious with each additional crime he commits. Yet the drama is played fairly realistically and remains believable throughout the film's entire running time. Viewer interest is achieved by including assorted oddball characters and with a spectacular chase during the final minutes, where O'Brien is embroiled in a tense shoot-out at a men's athletic club. 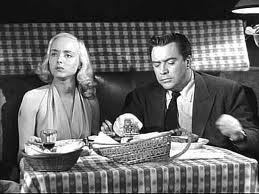 The supporting cast is more than adequate-- including a memorable turn by Carolyn Jones as the girl at the diner. And while the climactic ending is predictable, it's fun watching O'Brien's character get the usual what's-coming-to-him after causing so much trouble. I know Spencer Tracy was the studio's original pick, which I already mentioned, but I think Charles Bickford would have been a very acceptable choice, too. By the way, tomorrow I am reviewing THE PRIVATE LIVES OF ELIZABETH AND ESSEX. While I do not discuss the infamous slap scene, I do cover the actors' chemistry (or lack thereof). And I give Errol a bit more credit than Bette for making the picture work. TopBilled, do you mind if I offer up my own review of Shield For Murder? It must not be very good because it's gotten several negative votes over at imdb. This film has great atmosphere and starts out with promise, but it bogs down pretty quickly. For one, Edmund O'Brien is playing a man who has been a police detective for 16 years yet he kills a guy in cold blood in an alley with apparently two apartment complexes full of windows looking down on what he is doing. Also, the 25K that the detective steals from the man he kills was slated to go to a very violent gangster who has an accurate account of the comings and goings of the dead man. O'Brien owns up to the shooting itself but tells internal affairs that his gun misfired on a fleeing perp, so now the gangster knows exactly who to point the finger at. Plus the detective is known as a marksman and crack shot. All in all, Leslie Nielson's Frank Drebbin couldn't have done a worse job. The detective is willing to kill to get this 25K so he can buy a rather modest tract house and live the middle class dream with his barroom cigarette-girl girlfriend as his wife. He just wants to live like a normal guy and get out of the "muck" of the criminal element even though his act has turned him into that criminal element. The rest of the film is spent trying to show how the detective went bad, and the conflicted feelings of the man doing the internal police investigation on the shooting. The investigator happens to be someone who, as a kid, O'Brien's character rescued from a life of crime. It's a pretty good character study and crime drama with some interesting twists and turns, but it's definitely not a ground-breaking noir. If anyone can tell me what is wrong with this review it would be appreciated. Anything to make me a better writer. As you know, there are many reasons why people like or dislike something. Your summary seems fine to me. When doing a review, we make editorial choices. For instance, I was going to mention O'Brien co-directing the film, but I dropped that angle, because I felt it would make my review focus more on the mechanics of how it was made, instead of the actual finished product. I also did not cover the subplot, which was about post-war housing. I am glad you discussed that, and it gives your review a different perspective. I am as baffled as you are about studio casting. Originally, the female lead of IN PERSON was offered to Katharine Hepburn, whom you mentioned. She did not like the part in the script where the character disguises herself, in order to avoid a mob of fans, by wearing buck teeth. So she nixed taking the assignment. 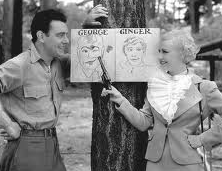 Ginger, at this time, was looking to stretch herself as a comedienne, and she saw the possibilities of poking fun at the acting profession and glamorous Hollywood, so she jumped at the chance to do it. It is funny in itself to think of Astaire and Brent vying for the same roles. They couldn't be more different if they tried. Probably if Astaire had done it, Pandro Berman would have changed to it a musical comedy and it would not at all be the film we have today. Ginger does perform two quick musical numbers in the picture, but the emphasis is on romantic comedy. She and George Brent have marvelous chemistry.